'CASES' Somerset Rebels reserves, Henry Atkins and Anders Rowe, have a big week ahead of them, for besides travelling with the Rebels on Wednesday for a crucial SGB Championship Shield group fixture on Wednesday against Birmingham, they both have semi-final rounds of the British U21 championship to contend with. Anders is first up, having had his round switched to the Isle of Wight on Tuesday evening. Rowe was initially expected to be part of Friday's field at the Oaktree Arena but the date clashed with his Kent Kings obligations as they are racing at Plymouth the same night. 16 year old Rowe is quite content with his switch of venue admitting "Of course it would have been nice to have ridden in front of the Somerset fans to have the extra support, but the Island is a track I really like and have more experience of than the Oaktree to be honest. I have had some reasonable scores there with Kent and I will be heading there looking to try and grab one of those qualifying spots." Atkins, who featured in a crowd pleasing heat 4 win in front of the Rebels fans last Wednesday night, will have the benefit of local support when Somerset host the second semi-final on Friday night (7.30pm). Being partnered to a 5-1 with Chris Harris to chalk up his first win at Championship level, has plenty of experience around the Oaktree and will be amongst many people's favourites to qualify through. Over the weekend contender Sam Bebee was forced to withdraw from the line-up after he sustained a broken vertebrae whilst practicing at Mildenhall on Saturday. His place will be taken be his Mildenhall team-mate Eliiott Kelly. 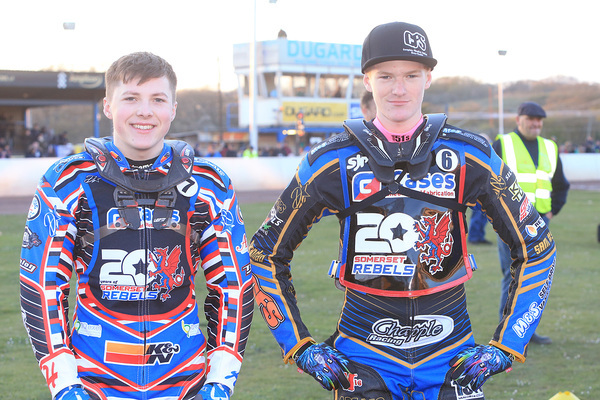 The top three finishers from each semi-final will join the 10-seeded riders in the U21 Final to be held at Berwick on Saturday 27th April. Seeds: Robert Lambert (King’s Lynn), Dan Bewley (Belle Vue), Zach Wajtknecht (Swindon/Birmingham), Nathan Greaves (Redcar), Jack Smith (Redcar), Jack Thomas (Leicester), Drew Kemp (Sheffield/Kent), Leon Flint (Berwick/Belle Vue Colts), Tom Brennan (Eastbourne/Cradley), Kyle Bickley (Glasgow/Belle Vue Colts).